You do not possess a valid secondary form of identification as required to take the Uniform CPA Examination. Candidates should allow adequate time prior to their examination appointment for processing and mailing of the NASBA Identification Card. The expiration date of the NASBA Candidate Identification Card is one year from the date of purchase. Processing time is typically 5 business days. 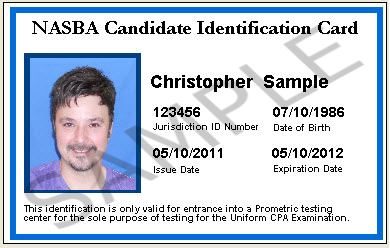 The NASBA Candidate Identification Card will be mailed via US Mail and includes free shipping within the United States. Candidates that requesting express shipping services are required to pay additional shipping costs and duties at checkout. Select Document Type Valid Certificate of Alien Registration Japan Valid Govt. Issued Drivers License (Printed in English) Valid Govt. Issued Passport Valid U.S. Drivers License Valid U.S. Military I.D. Valid U.S. State I.D.